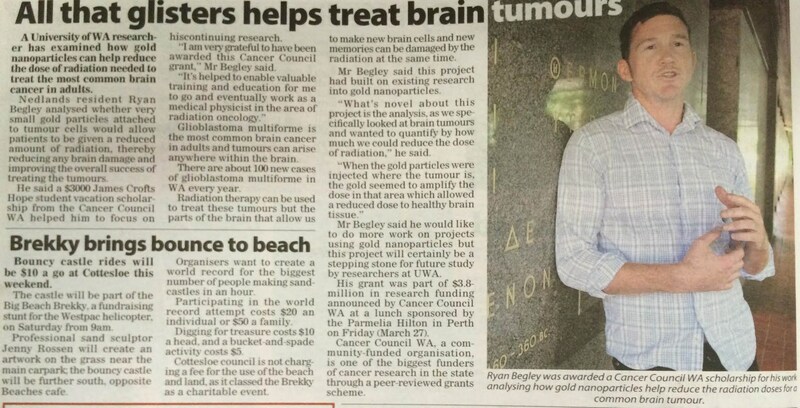 Ryan Begley, a first year student in the Master of Physics: Medical Physics program, was interviewed by the Post Newspapers for his research into using gold nanoparticles as a delivery method for radiation in order to better treat tumours. Thanks to James Crofts Hope Foundation for supporting Ryan Begley’s research. “Gold Nanoparticles as Novel Agents for Cancer Therapy” by S. Jain et al. from The British Journal of Radiology. This article is misleading, WA Cancer Council did not fund the grant, the James crofts Hope Foundation Inc funded this grant it is our Scholarship.